As someone who was raised in Germany and now lives in New Zealand, I’ve got to say I love this videoclip! Most of New Zealand’s houses have poor thermal performance. In winter, most of them are cold and damp. The remainder are warm but expensive to run. Ian Mayes says the problem is most Kiwis have not lived in warm, dry homes; poor quality homes have been normalised. It is so common, that parts of the Census is dedicated to asking whether your home is cold and whether these is mould growing in it. We should all have thermo hygrometers in our homes. If everyone had one, there would be riots as people realise they are paying so much for cold, damp, poorly performing homes. Our homes can be made warmer by heating them well and reducing heat loss. There are different ways we can heat out homes, and EECA has created a great resource to compare the options, depending on the size and use of the space you want to heat. Tips on insulating and reducing heat loss can be found in this blog post but here’s a little bit of extra info about my favourite topic – windows! A single pane of glass only has an R-value of between 0.15 and 0.19. Standard double glazing is around R 0.26 and the fanciest double glazing might reach R 0.6. 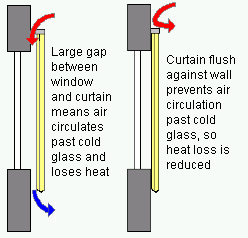 Because even the best double glazed windows still have low insulating abilities, curtaining is very important. Cover ALL glass. Windows. Doors. Funny glazed spots. The lot. Always 2+ layers. It is the air around and between layers that insulates, rather than the material itself. A single layer doesn’t trap nearly as much heat as a double layer. Stop reverse convection currents. By having curtains touching the floor, or pelmets, or both! Good behaviour. Close curtains in the afternoon, to stop daytime heat escaping. Open curtains in the morning to allow heat in during the day. Ventilation and moisture control can help us make homes drier. Note: Ventilation is different to draughts in that the former is a chosen air exchange, while draughts are uncontrolled air exchanges and heat leakages. We want less moisture in our homes because it makes them healthier and less prone to mould. Good ventilation combined with other moisture control practices can reduce relative humidity. Once again, EECA have created a great resource for tackling dampness and reducing indoor moisture, which can be found here: www.energywise.govt.nz/at-home/dampness.